Golden Cherry Casino is becoming well-known for its variety of high quality games, and this is thanks in large part to Rival Gaming, an up and coming software company that designs most of Golden Cherry software. Started in 2006, Rival Gaming has quickly moved up the ranks of software design companies, particularly in the online casino gaming sector, largely because of its innovate and tech-savvy creations that are designed to be compatible with both Macs and PCs. All of the Rival games are reviewed and tested repeatedly, to ensure that they are fully functional, free of glitches, and resistant to any hacking attempts by those looking to beat the system. If a player encounters any rare problems or difficulties with the software, the online casino's friendly customer service reps can provide assistance. One of the reasons that Rival casino software has become so popular is all the updates and innovations that the software provider has delivered to it's casino licensees. For example, the software design company has rolled out a series of iSlots, or interactive slots, which are essentially souped-up versions of traditional slot machines. While the concept of the slot machine stays the same (i.e. you spin a reel and hope that luck is on your side), the interactive versions spice up the game a bit by providing narratives and graphics to enhance the playing experience. The stories are adjusted according to each player's performance at the slots, thus rendering each i-Slot narrative unique to the individual. Another benefit of the Rival games that have been commissioned by Golden Cherry Casino is their fast download speed. 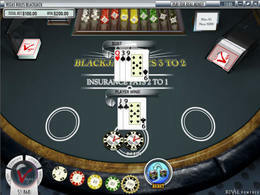 Many users have commented on the fact that the games -- which are as advanced as any in the industry -- download to home computers noticeably faster than those at other online casinos. All of the games also boast stunning graphics and top-notch sound quality. While some have remarked that the Golden Cherry's overall repertoire is somewhat limited, the casino still boasts all of the classic games--from blackjack to baccarat to poker--as well as contemporary iterations, such as video poker. Moreover, all of the software is licensed, approved, and uses the RNG (random number generator) to ensure fair play.